The Chicago Bulls announced today the signing of free agents Jarell Eddie and Jaylen Johnson to round out their 2017-18 training camp roster. Per team policy, terms of the contracts were not disclosed. Eddie (6-7, 218) saw action in five games for the Phoenix Suns last season, along with 45 appearances in the NBA G League for the Austin Spurs and Windy City Bulls. Eddie totaled 4.8 ppg and 1.4 rpg in 12.4 mpg for the Suns during a 10-day contract. In his G League action, he averaged 14.1 ppg, 3.9 rpg and 1.5 apg in 28.3 mpg total, including 17.8 ppg, 4.5 rpg and 2.0 apg in 20 games for the Windy City Bulls. The Tampa, Florida, native played in 26 games for the Washington Wizards in 2015-16, scoring 2.4 ppg in 5.7 mpg. Johnson (6-9, 230) played three seasons at Louisville (2014-17). He saw action in 88 games (48 starts) in his three-year tenure with the Cardinals, improving his averages in every statistical category after each season. In his final season in 2016-17, Johnson started 26 games and played 20.5 mpg, posting 8.0 ppg and 5.8 rpg while shooting .589 from the floor. The Bulls will open training camp today with Media Day at the Advocate Center. 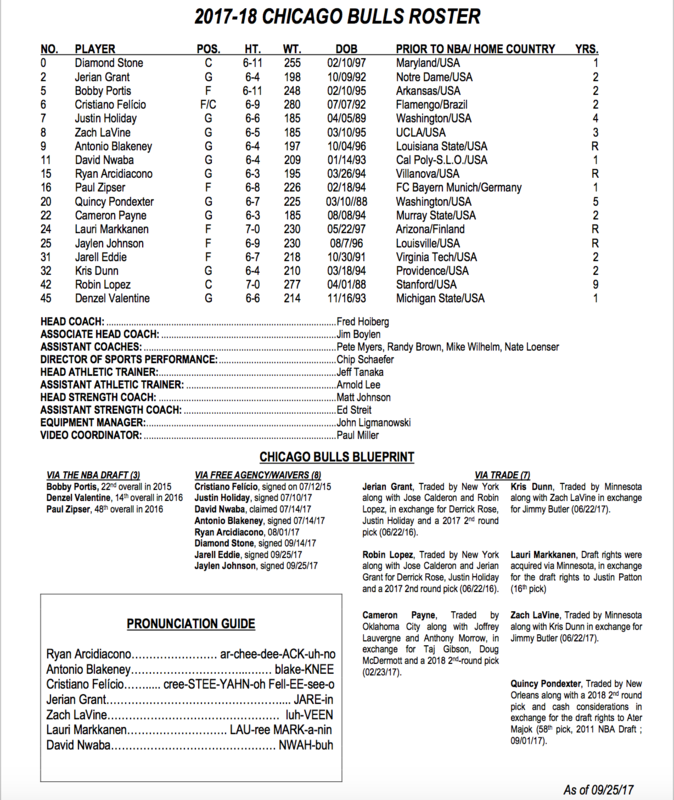 Chicago’s full roster is below and now stands at 18.